The weekend of October 17-19 is the Fourth annual Arts and Eats Tour of Southwestern Michigan. The tour covers a self-guided trip through Allegan, Barry, and Kalamazoo Counties. The stops include local art, food, and agriculture in some out-of-the-way places. There, you will discover art being created, restaurants to enjoy, and farms with fresh hand-selected edibles. Choose everything from eggs and vegetables to farm animals and hard cider plus several makers of Michigan wine. The tour includes visits in the Lake Michigan beach towns of Saugatuck and South Haven along with inland cities of Allegan, Fennville, Hastings, Richland, Plainwell, and more. The online map will guide you around the three counties with 50 stops for you to enjoy. Artwork includes pottery, weaving, soaps, painting, watercolors, jewelry, fiber fashions, wood, and paper. A bicycle route can also be found online for the outdoor enthusiasts. Traverse the entire route or find a central location, make that your weekend headquarters, and explore from there. Stop to rest and eat with choices including brew pubs, fine dining, casual eateries, and ice cream to fill you up for the next portion of your tour. Simple home-cooked comfort food plus burgers, pizza, steak, and seafood can be found at an assortment of great eating establishments along the tour. Excellent choices for a unique lodging experience include J. Paules Fenn Inn. 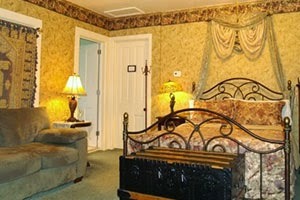 It is a traditional pet friendly B&B in Fennville. Between eating and viewing art, stop at one of the several farms and enjoy products fresh from the farms to take home. After dinner, Gun Lake Casino is a fun place for your gambling and entertainment pleasure. Peak Fall Colors are happening right now in South Western Michigan. Your tour is waiting for you on October 18 and 19, or explore on your own any time of year. This entry was posted in Fall and tagged Fall Colors, Fall Getaway Ideas, J Paules Fenn Inn by admin. Bookmark the permalink.